Ten years ago, on returning to the US from Australia, Ben Folds purchased a heritage studio in Nashville, primarily as a workshop and creative space. The studio, originally built by Chet Atkins for RCA Victor Records in the 1960s, has seen sessions by Elvis Presley, Waylon Jennings, Willie Nelson, Roy Orbison and Dolly Parton. 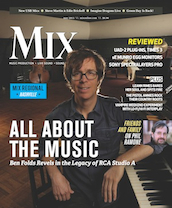 A story about the legendary recording space is featured in the cover story in the May 2013 issue of Mix Magazine, the leading magazine of professional audio and music production, and the cover (shown at left) depicts Ben at the keyboard in what was commonly known as RCA Studio A.
Ben’s history with the studio goes back to his formative years as a musician, where much of the material which later became Ben Folds Five was developed during late-night sessions after all the big stars of the time left for the day. Now Ben, being one himself, is hosting sessions by many of those big stars including Tony Bennett, Steve Earle and John Hiatt. For those interested in technical details, there’s plenty of info on consoles, microphones and processing as well as acoustics and pianos. Mix is available in online and print subscriptions, on newsstands, and at music and recording equipment retailers nationwide. Posted in: Check your papers and the TV, News.